A HENLEY physiotherapy firm treated three British Olympians after they took part in this year’s Tough Mudder challenge for a television programme. Angela Botha and Nico Kirschstein Smith, of Physiolistic, gave massages and recovery advice to cyclist Jessica Varnish, athlete Perri Shakes-Drayton and snowboarder Aimee Fuller. The trio were competing alongside jockey and former cyclist Victoria Pendleton, martial arts expert Jade Jones and boxer Anthony Fowler as part of a Sky documentary which follows them as they take part in Tough Mudder events around the world. 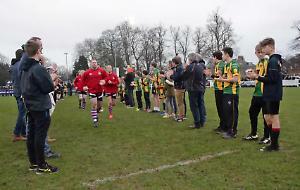 Physiolistic, which is based at Henley Rugby Club, off Marlow Road, was invited to take part as the production crew works with local businesses at each event venue. Mrs Botha, who is the company’s clinical director, said: “These athletes perform at the very top level of their discipline and our team was pleased to ensure they recovered quickly while providing treatment and advice for their next challenge.